This module from Frog God Games is 42 pages long, 1 page front cover, 1 page editorial, 1 page ToC, 2 pages of advertisements and 1 page SRD, leaving 36 pages of content, so let’s check out this Hex Crawl. Hex Crawl? Yep, it’s a kind of adventure that has unfortunately gone nearly extinct in this day and age. If you’re looking for a wholly spelt-out adventure with a linear story, this kind of adventure is not for you – the closest analogy being in computer games Fallout 2, Baldur’s Gate 1 or Arcanum – you have this map (which is full of numbered hexes, hence hex-crawl) and you move around on it, stumbling across random encounters, settlements, dungeons, NPCs etc. 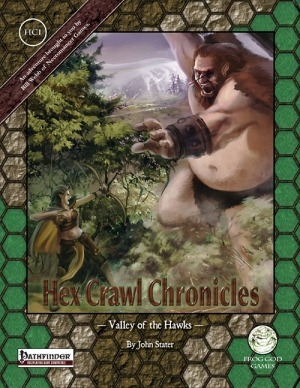 The true motivation of these kind of adventures comes from a sense of discovery, a wonder at the strangeness and yet familiarity of the things we find drives a good hex crawl – the aim is to simulate an area and provide a sandbox in the truest sense of the word – a playing ground with power-balances that your PCs can change. The amount of information necessitated to make such an endeavour work has the logical conclusion of providing not the full statblocks for all the NPCs – you’ll encounter some abbreviated ones in this book, which you can expand upon. From here on, SPOILERS reign, so please potential players, stop reading and jump to the conclusion. So how does John Stater’s Valley of the Hawks hold up? The Valley of the Hawks is inhabited by 3 different human ethnicities and offers a plethora of settlements – interestingly enough, for example, the Northmen are dusky-skinned, rather civilized individuals, offering a nice twist from standard cultural clichés. Were I to go over the vast amount of information, adventure-seeds etc. contained herein, I’d be writing this review for a week – just to give you an overview: Most settlements have either a tyrant, an external force, a cult devoted to some depraved (or just savage)god/demons for the PCs to stomp out and from slavery to love triangles, kidnappings and enmities, the PCs can encounter a vast array of potential allies and foes, who in their at times primal feeling, succeed at hearkening back to the classics of the Swords & Sorcery-genre while capturing the atmosphere of wonder and astonishment that should be the essence of wilderness adventures at a kind of magical frontier. Even better, the pdf also has room for easter-eggs – Let me just say two words: Kill-Bunnies! Humanoid bipedal, bloodthirsty rabbits haunt one of the hexes! AWESOME! Have I mentioned the mechanical milkmaids or the space-vampires with their crashed space-ship? The wise Owl-folk? The elves of the Winter Court? The mini-dungeon called Temple of the Snake-men (complete with its own map)? Editing and formatting is top-notch, I didn’t notice any glitches. Layout adheres to an easy-to-read two-column standard and the b/w-artworks rock. The maps are awesome as well and the pdf is extensively bookmarked. Writing-wise I was wowed by the cultural micro-cosmos presented herein, the vast amount of information, the Easter-eggs, the huge array of adventure hooks and most importantly, the wonder of discovery and vast amount of content crammed herein. Try as I might, I can’t bring myself to say anything negative about this adventure-sandbox. If you’re willing to expand upon the basic information herein, I think you could easily spend a year in the valley of hawks. This pdf gets my Endzeitgeist seal of approval as well as the full 5 stars – check it out! NextWhy RPGs aren’t mainstream anymore.